Although it was over twenty-five years ago, I still have an extremely vivid memory of the night when I met Margaret Thatcher. It was at a cheese and wine party in Finchley, North London; it was sponsored by the local Conservative Association for people to meet their Member of Parliament, who was also Prime Minister. 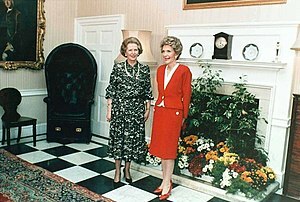 Aides told us that when Margaret Thatcher arrived that we should stay where we were as she liked to “work the room” at her own pace, and she always managed to talk to everybody. We shared some small talk with the aides and were reminded that Margaret Thatcher played a full part in her political constituency. When it was our turn, Margaret Thatcher was interested in where we lived and I asked her about the whiskey in the tumbler in her hand. She replied that she treated herself to one glass of whiskey and soda each evening. The conversation was very natural, ordinary and soon she was talking to somebody else. I have always been a passionate Margaret Thatcher supporter. I was extremely saddened at the way the Conservative Party conspired against her and brought her down. She never deserved that humiliation. I remember well the photos of her in tears as she was driven away from 10 Downing Street after she was hounded from office. I have been a Conservative Party supporter all my life. My political views are set out in my blog. However, for me, after Margaret Thatcher’s downfall, the Conservative Party was never quite the same. The UK and the world has lost a strong supporter of economic freedom and liberty in general. 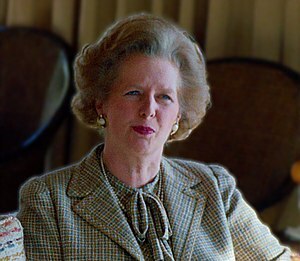 As the world is becoming more and more smitten with socialist principles, we need more strong leaders such as Thatcher to support and push for the true liberal legacy of the enlightenment and freedom of the individual. It sickens me to see these hoodlums celebrating her death with song and party, but bless their hearts, how can they not, when they have been so indoctrinated over the course of their lives from media, ‘intellectuals’ and societal trends in general.